A Chopart's fracture-dislocation is a dislocation of the mid-tarsal joints of the foot, often with associated fractures of the calcaneus, cuboid and navicular bone. The transverse tarsal joint is also called the midtarsal joint and is referred to as Chopart’s joint. 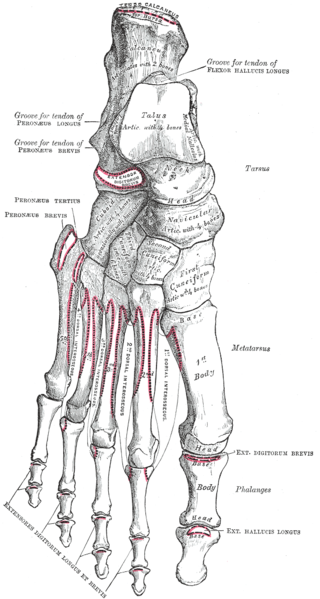 The midtarsal joint is composed of the talonavicular and calcaneocuboid joints. The bones which go into the formation of this Chopart joint are the talus and calcaneus proximally, and the navicular and cuboid bone distally. When the foot skeleton is viewed from above, the joint line of the transverse tarsal articulation has the shape of an 'S'. Among the uncommon midfoot injuries, Chopart joint dislocations or fracture-dislocations are the most severe injuries. Chopart fracture-dislocations are caused most commonly by motor vehicle accidents and falls from a height. Avulsion fractures localized to the midfoot are typically caused by low-energy trauma, e.g., sprain or sports injuries. Concomitant fractures occur in approximately 75% to 90% of Chopart injuries, and only 10% to 25% of the Chopart dislocations are pure ligamentous injuries. Injuries with a combined Chopart and Lisfranc fracture-dislocation are often part of so called "crush" injuries of the foot. Chopart joint dislocations and especially fracture-dislocations are still problematic in both diagnosis (they are missed or misdiagnosed in up to 41% of cases) and treatment and result in a high degree of long-term morbidity. Isolated midtarsal dislocations are rare because of the close proximity of the midtarsal to subtalar and Lisfranc joints. Crush injuries of the foot often cause gross soft tissue damage and have very high rates of deep infection. The symptoms and signs of a Chopart fracture-dislocation are: Abnormal position of the forefoot to medial direction, swelling of the dorsum of foot and pain in the midtarsal region when it gets strained. Injuries involving the Chopart joint complex are rare and frequently missed or misdiagnosed. Dislocation is often combined with fracture in these areas. Serious injuries may present in a subtle manner and are often misdiagnosed as a sprain. Small avulsion fractures of the navicular and cuboid may be misdiagnosed as a simple avulsion when in fact they represent a more severe midfoot injury. A high index of suspicion is required. For the initial diagnosis, x-rays in three views (dorsoplantar, lateral and oblique) are currently recommended. In case of a present injury or in doubt, a CT scan or MRI should be performed. Knowledge of the exact radiographic projections is essential for making the correct diagnosis. For preoperative planning the routine use of CT scanning is suggested. In any case of isolated navicular or cuboid compression fractures a corresponding ligamentous injury to the other side of the mid-tarsal joint has to be ruled out by stress films. Furthermore the examination of the foot should include an evaluation of the patient's gait and extra attention should be paid to malalignment and swelling of the foot. A nonoperative treatment is used in nondislocated or minimally dislocated fractures. Closed reduction is the most known nonoperative treatment. After closed reduction a rigid leg cast for 6 to 8 weeks with partial weight bearing is recommended. Medication to prevent deep venous thrombosis is commonly given to patients, treated with a short leg cast with reduced weight bearing status. Though external fixation is a useful tool for the treatment of complex foot injuries, it is often associated with problematic residual stiffness of the foot and ankle. Open reduction should be considered if closed reduction could not achieve the correct anatomic alignment. The aim of treatment of a Chopart fracture or dislocation should be reconstruction of the medial and lateral foot arch, and achieving congruent joint surfaces and ligamentous stability. Attention should be paid to the talonavicular joint because it is essential for satisfactory function of the ankle. Traditionally, open reduction improves outcome in Chopart fracture-dislocations and complex midfoot fractures, because ligamentous structures can be repaired and joint surfaces can be reconstructed. Physical therapy intervention should begin as soon as possible. As the patient will be immobilised for a period of weeks, the physiotherapist role is to educate and facilitate the patient on the importance and methods to maintain surrounding muscular strength and range of motion, maintain functional independence as much as is possible, prevent secondary complications & deliver effective cast care advice and mobility progression as appropriate. Following the immobilisation period, permitted physiotherapy interventions are usually guided by the treating orthopaedic surgeon. Common types of rehabilitation include techniques to reduce edema, strengthening exercises, static and dynamic flexibility exercises, gait training and weight bearing progression, proprioceptive training and return-to-sport specific preparation. Midfoot injuries have a high rate of mid and long-term morbidity. This is because of the crucial role of the midfoot in the balance and stability and the foot. A fracture dislocation of a midfoot bone results in a higher morbidity and greater functional impairment than an isolated midfoot fracture. The prognosis is improved by achieving good joint congruency post reduction. If the injury doesn’t result in chronic subluxation, the patient is mobilized earlier. If the injury results in chronic subluxation, the patient will often develop chronic pain exacerbated by loading and osteoarthritis will develop in the involved joints. Polytrauma patients, open injuries, and the occurrence of compartment syndrome have been identified as significant variables that worsen final outcome after midfoot fractures and dislocation. Due to risk of developing post-traumatic arthrosis, long-term follow-up evaluation is an important aspect of the management of patients who have sustained dislocation of the mid tarsal joint. ↑ Signe Brunnstrom, M.A. (1975). Clinical Kinesiology. Philadelphia: F.A. Davis Company. ↑ 7.0 7.1 7.2 7.3 Bahr, R., & Maehlum, S. (2004). Clinical Guide to Sports Injuries. Oslo: Human Kinetics.